socca is a provincial savory pancake simply made with chickpea flour (also known as gram flour), olive oil, water and salt. which makes it completely vegan and gluten-free and very nutritious. chickpea flour is rich in protein, fiber, vitamins and minerals. read more about it here. the first time i tried it was a long time ago in nice, france. a woman and her husband had a line out the front of their stall and were serving up these little crispy, savory treats. the way they are traditionally served in nice is straight out of the wood-fired oven with freshly ground black pepper on top, wrapped in some paper and enjoyed with a glass of rosé! 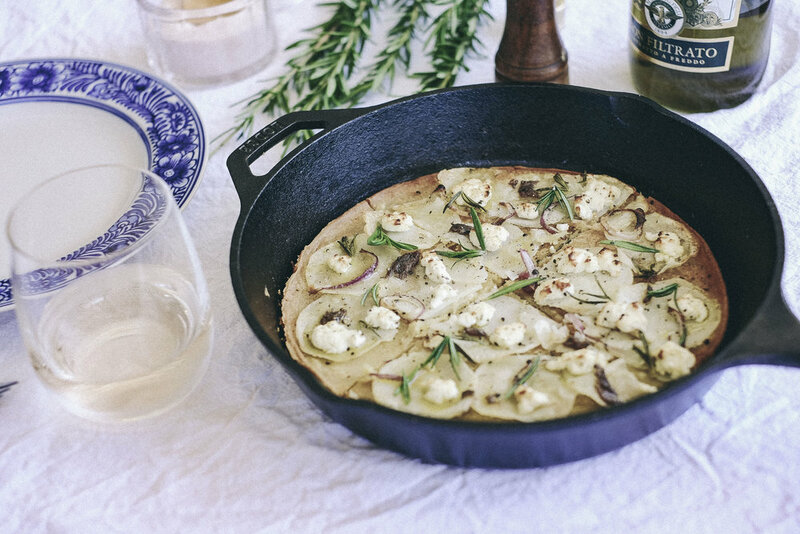 4 / remove from oven and add potato, rosemary, goats cheese, onion, anchovies, a drizzle of olive oil and salt and pepper and place back in oven until potato is crisp (about 10-15 minutes).